Need an alternative to Coravin? Here is a much more cost- and time efficient solution to keep your wines from oxidization. The Repour stopper is the easiest, most effective wine preserver there is. Invented and developed by Chemist and Founder Tom Lutz, Repour is the first of its kind to actively and continuously preserve original aroma and taste by eliminating ALL of the oxygen from your wine. No oxygen means your wine doesn’t degrade. 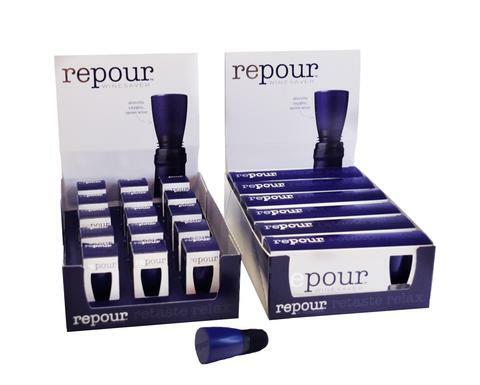 ​Instead of throwing out a bottle of wine that has gone bad, or messing with complex and ineffective vacuums, pumps, cartridges, batteries, and other contraptions, simply insert the Repour wine stopper in place of the bottle’s original cork, and preserve the wine for the life of the opened bottle. Your favorite wine, simply saved and perfectly preserved. Enjoy every glass. ​"Everyone with restaurant experience knows the sad sorry of a great bottle of wine being opened for a glass pour, then it gets sent to the purgatory of hanging around the backbar, going unsold for a few days. Until one day the cork is pulled and sadly the remains of that bottle have to be poured down the drain, or sent to the kitchen for cooking, as it's just a shadow of the greatness that it once was. The fact that Repour brings spoilage down to nearly nil, in and of itself is a really big deal." "We pour over 70 wines by the taste and by the glass in our wine shop and tasting room in Yountville. Before using Repour, we were wasting quite a bit of wine. The Coravin is not optimized for pouring two ounce pours over a long period of time, so when bottles would get below 1/2 full, they would start to oxidize and we would have to use them quickly or lose them. Since we started using Repour in July, our lost wine on bottles we use a Repour on have dropped to nearly zero. Thanks for creating such a brilliant product."